Simply put, bar prep is overwhelming. With a seemingly infinite amount of information to memorize and a never-ending full-time study schedule, it’s no wonder why students so often get caught up in their comprehensive courses and fail to evaluate whether or not their study techniques are actually preparing them for the exam. Fortunately, bar prep doesn’t have to be this complicated. It’s less overwhelming. You don’t have to answer 50 questions a day to see results. Anyone can answer a set number of questions, but it’s another thing to fully understand why you got an answer correct or incorrect. With AdaptiBar, quality is stressed over quantity. It’s more effective. Why practice with simulated questions when you can study with licensed questions from the NCBE that appeared on past exams? If you don’t know how to answer that, we don’t either. It’s diagnostic. AdaptiBar’s patented adaptive technology targets your weaknesses, without neglecting an area of strength, so that you are constantly improving. It gives real confidence. This is opposed to the fake confidence you get when you are preparing with simulated questions that aren’t an accurate representation of what the MBE questions will actually look like on exam day. You’ll know if you’ll pass. AdaptiBar gives you a proven accurate prediction of how you will score on the actual MBE. Review the outlines provided by your comprehensive course, in detail, before answering any MBE Practice Questions. Never answer practice questions in your comprehensive course. These questions are simulated and do not accurately reflect the format and content of the material that you will see on the actual bar exam. Use AdaptiBar’s licensed questions instead. Remember that quality is more effective than quantity! Are you scheduled to answer 50 MBE practice questions in your course? Don’t force yourself into information overload! Answer between 30 and 50 questions in AdaptiBar instead. Answer in Practice Questions mode only. 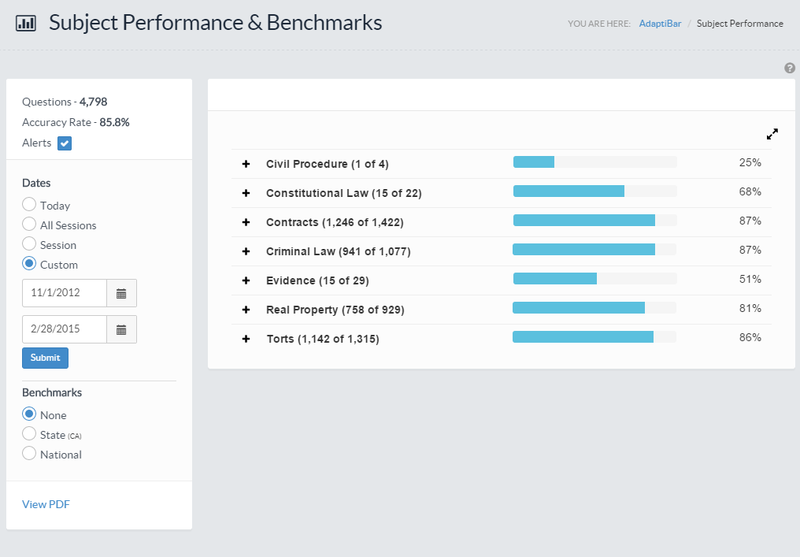 While you can target specific subjects that you would like to be tested on in AdaptiBar, it is recommended that you ‘Select All’ subjects once you have answered about 50 questions in each individual subject. This way, the program’s adaptive technology can identify your weaknesses and feed you more questions in those areas. Consistently use your comprehensive course outlines to study your weaknesses so that you are always improving on the MBE. To diagnose your weaknesses, simply look under the ‘Past Performance Table’ to see your progress in sets of 350 questions, or ‘Subject Performance’ to view your overall performance statistics in all 7 subjects and 41 subtopics. For step-by step-instructions on how to maximize your use of AdaptiBar with your comprehensive course, see AdaptiBar’s Preparation Method. Keep in mind that you should aim for a 70% accuracy rate in the program to be at a good standing on the MBE before the bar exam. Questions? Contact the AdaptiBar Team at info@adaptibar.com or on Facebook.